I'm self-published. I have tried to get an agent since 1977 and no one in the publishing industry thinks my writing is worth a hill of beans. So finally I said, "screw'em all." Actually, I counted 1,400+ rejection letters over the years before I gave up counting. This does not count screenplay rejections. SO my path to publishing has been one rejection after another. The only summation that I have is that I must have needed to get beat up verbally or in writing...kicked and punched emotionally...causing me to never give up one of my dearest loves in this lifetime--writing. When JK Rowling finished Harry Potter not one agent in the UK took her seriously. They all turned her down. Then a very small publishing house said they'd publish it because it's an interesting story but "don't expect to make any money off Harry Potter." Later, I saw JK Rowling in a TV special. They asked a few agents and publishers why they had turned her down and they all claimed they had never heard of her prior to her fame. I'm not saying I'm a great writer or even a good writer, but I'm against the "gate keepers" in and around the publishing industry who do not have an ounce of creativity flowing in their blood and yet, they will tell the reading public what is sent to a publisher and what gets filed under "G" for garbage. Lucas could not sell anyone on the idea of Star Wars. Then a studio agreed to make the movie only if George would waive all his fees for writing and directing the movie, etc. He'd only be paid if and when Star Wars made a profit, which of course eventually made him a billion dollars. William Goldman, who was a famous pulp fiction writer from the '60s and 70's, (I used to read his books back in those days) could not sell the screenplay Butch Cassidy and The Sundance Kid to anyone. After over 6 months of pedaling it in Hollywood, a few studies finally bid on it because Newman and Redford were now interested. Getting published or selling a screenplay to the "establishment" can be no more than the luck of the draw, but yes, there's serious talent out there. Unfortunately, a lot of hidden talent is destroyed by rejection and the injection of defeat and despair. Writing is not for the faint of heart. A secondary note: The key to writing is not just a good story or an idea. The power of the written word is in the editing. I spend as much time in the editing process as I do in the writing. For me, writing is easy. It's the editing that's so damn difficult. Now the difficulty will be trying to find readers who will take my writing seriously. Then again, the "READER is KING," not the publishing houses or the agents. However, if the readers of the world do not want to read my work, or if they want to ignore it, I'll accept that judgment from them...fair is fair. What is the important thing here? At the end of this lifetime, I want to look back and say, "I tried to do the best I could. No regrets!" If I fail in this lifetime, then by God's grace, I'll get it right in the next lifetime. I am grateful life is cyclical." After Dr. Sydney Caldwell discovers a powerful new energy, associates team up with terrorists to steal her discoveries so they can dominate the world. Now she must stop them before they misuse this energy and destroy the planet. But, she is not alone. Her friend, Jonathan, and intergalactic friends arrive with otherworldly technology to assist her. 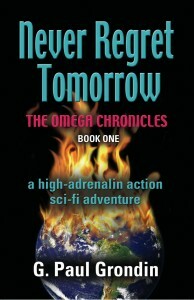 This action-packed, high-adrenalin Sci-Fi adventure will propel you across Russia, the U.S.A., Canada, the Bahamas and England. Thank you stopping by and sharing your thoughts and your path to publication, Paul! "...they all claimed they had never heard of her prior to her fame." This hit home for me personally because I was told by an editor that the house couldn't take me on because no one knew who I was. Yet, I've seen editors take a chance on colleagues who were also unknown so perhaps it was that particular book they weren't willing to take a chance on? Or maybe it's all just random--right place, right mood, right time. I will probably never know as I decided to go without my agent and a publisher and put one of my novels out there myself. So far it has been a wonderful experience!